Unstable fuel costs; increased governmental regulations; and rapid technological progress with corresponding reductions in technology costs, are the three primary factors for implementing new practices. Descartes next generation fleet management best practice implementation results in a 15-20% cost savings for fleet operations. Best-in-Class Fleets employ history to strategically plan their fleet asset allocation, to provide adequate assets to ensure service in each territory, and when appropriate, to develop master routes; they revisit these plans frequently to adjust for change - new customers, routes, seasonal demands, and other periodic peak demand issues. 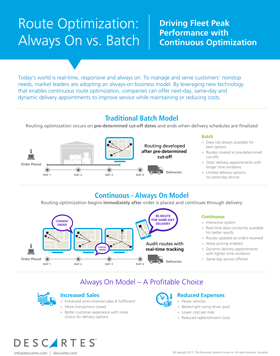 Best-in-Class Fleets develop optimized daily route plans; route plans can be optimized on cost-of-delivery or route profitability, as well as capacity to meet delivery requirements. The completed route plans contain vehicle and driver assignments and are downloaded to each individual in-vehicle system and/or driver handheld mobile device to direct the entire trip. Download our “Fuel & Labor Cost Savings through Next Generation Fleet Management Best Practices” business whitepaper as a PDF.